Born in the last decade by the Pentagon's call for a next-generation launcher of satellite cargos, Boeing's Delta 4 rocket did what it was designed to do Monday with the successful deployment of a $210 million military communications spacecraft. In a race against the clock, engineers overcame a series of glitches before watching the Air Force's first Evolved Expendable Launch Vehicle mission blast skyward just as the day's available launch window was closing. The Delta 4's main engine fired up and pushed the rocket into the Florida night at 7:59 p.m. EST. The two-stage, all-cryogenic rocket appeared to be moving in slow motion as it lumbered off pad 37B at Cape Canaveral. 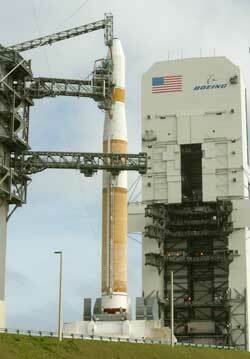 The Delta 4-Medium rocket is the least powerful of Boeing's new stable of boosters. Forty-two minutes later, while soaring off the east coast of southern Africa, the Air Force's Defense Satellite Communications System 3-A3 spacecraft was deployed into geosynchronous transfer orbit as cameras mounted to the Delta 4's upper stage beamed live views to Cape Canaveral. An orbital sunrise caused the 6,025-pound satellite to sparkle as it spun away to begin its 10-year mission in the military's global communications network. "It was really spectacular to see the satellite separating. We've never seen that," said Christine Anderson, the DSCS program manager. "It was so exciting when you saw that. It was like a diamond ring coming off. It looked absolutely great," added Jayne Schnaars, vice president of Boeing Launch Services. The Lockheed Martin-built craft will fire its Integrated Apogee Boost Subsystem, or IABS, kick stage in the coming days to nearly reach geostationary orbit. 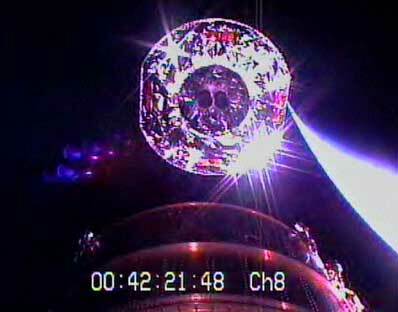 A later trim burn will place the craft into its final orbit some 22,300 miles above the equator. The satellite will undergo several months of testing before entering service this summer over the Indian Ocean region. 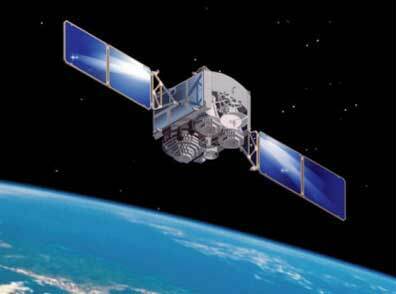 "The DSCS program has been a workhorse for military satellite communications for over three decades. The system provides high-priority communications such as the exchange of war fighting information between battlefield commanders on the ground and senior defense officials," said Maj. Travis Dixon, 45th Range Squadron operations officer at Cape Canaveral. "This particular mission is significant because of the force-enhancement value that it provides fighting men and women around the globe. Once on-orbit and on-line, it will provide high-volume, secure voice and data communications to land, sea and air forces. It is also resistant to jamming." "It really is the lifeline of our troops overseas," Anderson said. The DSCS system features 10 spacecraft separated into groups of five primary and five reserve satellites to cover the entire planet. The DSCS A3 bird launched Monday will replace the DSCS B12 satellite sent aloft in July 1992, which will be moved into a backup role. Remarkably, the DSCS A3 was built in 1978 and originally served as qualifying and ground test satellite, Anderson said. "We completely refurbished it in 1984. It was all ready to ship to the Cape when they stood down because of the shuttle problem. So it went into storage for a number of years. They brought it back out in about 1995. Again refurbished it and doubled the capacity," Anderson explained. "It is quite a different satellite than it started out as." 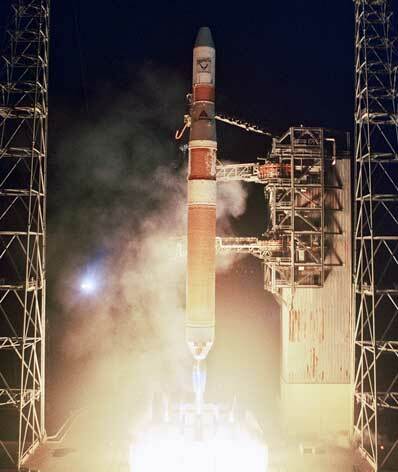 The final DSCS is scheduled for a July launch aboard another Delta 4 in what should virtually mirror Monday's mission. Two additional Delta 4 launches are planned later in the year -- the Delta 4-Heavy demonstration flight in September and the first West Coast mission in December to place a classified National Reconnaissance Office cargo into space. "I think the Delta 4 program has a very, very bright future," said Boeing Launch Services President Will Trafton. "We are two-for-two now. Of course, that's how you measure success in this business. We have a team that stays focused on mission success every single day and it pays off." Four or five Delta 4s are envisioned in 2004. For the Air Force, Monday marked the culmination of its program to develop a new American rocket system that will ensure reliable and affordable launches of military satellites through 2020. "In terms of national security and national security payloads, it couldn't have come at a more critical time," said Col. Susan Mashiko, director of the EELV program. "This helps provide the assured access for those payloads in their journey to space." 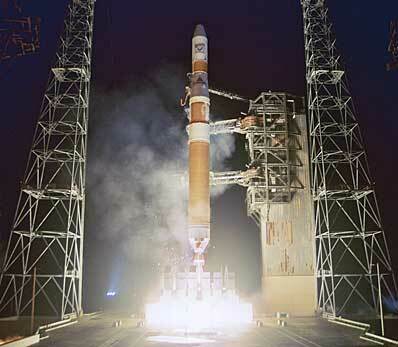 In the initial batch of Defense Department launch orders, Delta 4 was awarded 22 flights. The other EELV rocket -- Lockheed Martin's Atlas 5 -- received seven launches. Both Delta 4 and Atlas 5 are seeking to carve out a piece of the commercial satellite launch market, too. The rival rockets successfully performed their maiden flights last year carrying commercial European communications satellites.